This won’t be a lengthy article. There won’t be a bunch of numbers. No discussing a player’s decline or ascension. This is purely a call out to all of my fellow Kansas City Royals fans. It’s time. It’s time you get on board with this team. We have spent the better part of the last twenty years just wanting a team that could contend, just wanting a sniff of the playoffs. We bitched and moaned, we cried and yelled. We have been through every imaginable emotion known to man and it was all because we lived and breathed with this team. All we have wanted is have a winning team that realistically could play in October. Well, we are here. Sure, a lot of us still don’t have faith in Dayton Moore and Ned Yost. We don’t get warm fuzzy feelings about owner David Glass. Go ahead and throw logic out the window. Logic obviously isn’t steering this train. 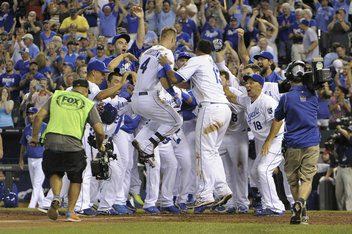 No, this group of players on this Royals team are finding ways to win and win consistently. Every morning I wake up and look at baseballprospectus.com/odds to see the chances of Kansas City getting to the playoffs. 80.7%. That is where they stand right now. The magic number is at 29. 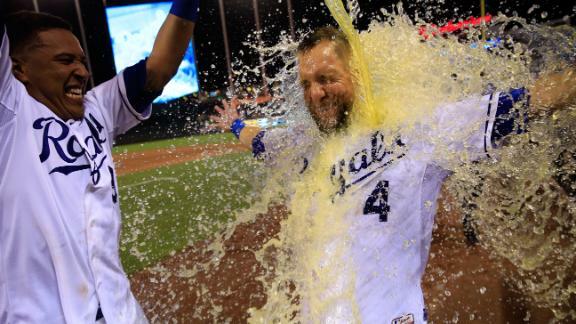 I beg of you Royals fans, don’t miss this. Quit analyzing all the time and just enjoy what is in front of us. We have a month of regular season baseball left. Let’s just enjoy the ride and worry about the consequences later. If you haven’t gotten those warm and tingly feelings as of late, then get there. It is truly a beautiful feeling. So Royals fans, jump on board. There is more than enough room. We are closer and closer to October baseball every day and I’m enjoying the hell out of it. Go ahead, enjoy it with me.